We don’t make a lot of Italian food in our house, simply because my husband doesn’t care for it. My daughter and I on the other hand, love it. I am always looking for amazing pasta recipes that will fill my craving for all things pasta but my husband will be happy to eat too. This recipe fits those requirements. I love the cheesy pasta and he loves the flavor of this dish. It is currently one of the only pasta dishes on our monthly rotation. The best part? It is super easy to pull together, making me love it even more. Prepare your pasta according the package directions. Add your spinach to the boiling water with the pasta for the last minute of your cooking time. Drain the pasta and spinach and return to the pot. Stir in the ricotta, half of the mozzarella cheese, a 1/2 cup of the Parmesan cheese and the spices. Press the mixture into a baking dish (9×13 Size) Top with the remaining mozzarella and Parmesan. Baked at 350 for 30 minutes or until the dish is bubbly. That sounds really good! I love Italian! YUM, sounds good. Thanks for sharing! This sounds so yummy! Thanks for the recipe! That sounds so easy! 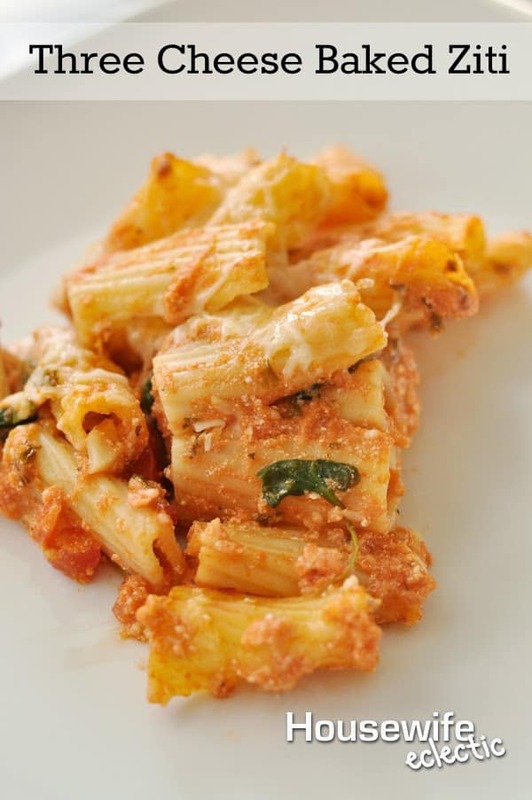 I honetsly dont think I have ever made baked ziti, but I am going to give it a try. Yum!! What a delicious recipe – this is easy enough I could even make it! Oh my! That looks so good! I know what I will be making for dinner tonight! Mmmmmmm! This Italian girl loves a good pasta dish! That looks so good! My favorite pasta is a spicy marinara sauce loaded with fresh veggies. I don't really have a recipe, I just throw whatever veggies are in my fridge. Dinner in 20 minutes, you can't beat it! That is such a hard question for me because I love pasta! Lasagna is definitely a favorite. Pass the pasta! This one looks awesome. I love ziti! Looks great. I haven't had ziti in forever! this looks so good. i'll have to make this. When do you add the pasta sauce? I assume the whole jar goes in with the ricotta, but you don't say in your instructions. Thank you for sharing this recipe with Foodie Friends Friday this past week. We are featuring it today on Daily Dish Magazine! When do i add the tomato sauce? Can you leave out the black pepper,garlic power and many people it feeds?